Learn how to use UC Learning Center to facilitate courses. In order to follow the instructions below, you must first login to UC Learning Center. If you are having difficulty logging in, see the UC Learning Center log in help page. Those who facilitate courses that are managed through the UC Learning Center will be given Instructor access. When logging into the UC Learning Center you can quickly access your Instructor Schedule to view any upcoming activities you have been set up as the Instructor for, any past activities you have instructed, as well as access the rosters and sign-in sheets for these activities. Click on the Self icon, then click Learning, then click Instructor Schedule. 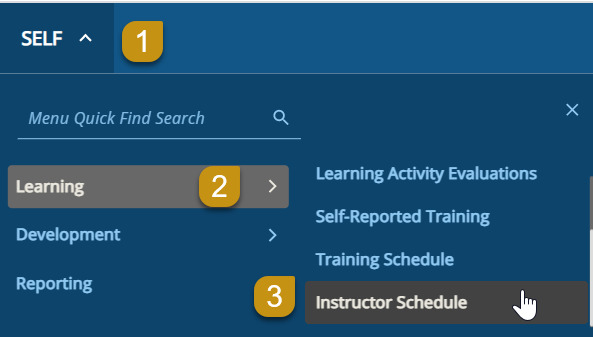 To view upcoming in-person offerings of activities where you are scheduled as the instructor, you can change your view to only show Upcoming Activities. Click the View menu in the right hand corner and change it to Upcoming Activities. Now you will see any upcoming in-person activities you are scheduled to instruct and you can view the roster or download the sign-in sheet. You can view the activity roster of any activity for which you are designated as an instructor. Locate the activity you wish view and click the Roster Icon. At the top of the roster you will see where you can search the roster for specific names, scroll through the records, and for ILT Class or ecourse, filter by Status such as Registered, Canceled, etc. You can increase the number of records shown by changing the Show Records number. Change the View drop down menu to show you who is on the Waiting List. Those on the waiting list will be informed automatically should a seat become available. However, if you have an additional need to email participants you can do so through the roster. 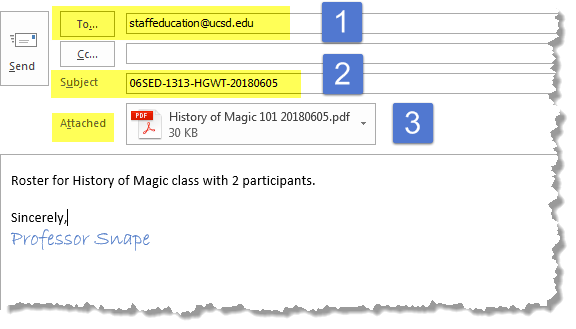 Select Upcoming Activities or Previous Activities if you wish to view the individual offerings you are scheduled to teach in the future or those you have taught in the past. Leave the selection as Current Activities if you wish to view the ILT Course rosters that will include the registration status for all offerings of the activity. Select the individuals you wish to email or select the top checkbox next to Name to include all the individuals shown. If your roster includes multiple pages, you will need to either do this for each page or change the number of records shown so that all participants are shown on one page. Once you have selected the individuals you wish to email, click Send Email. An Outlook message will open with the email addresses already populated for you. 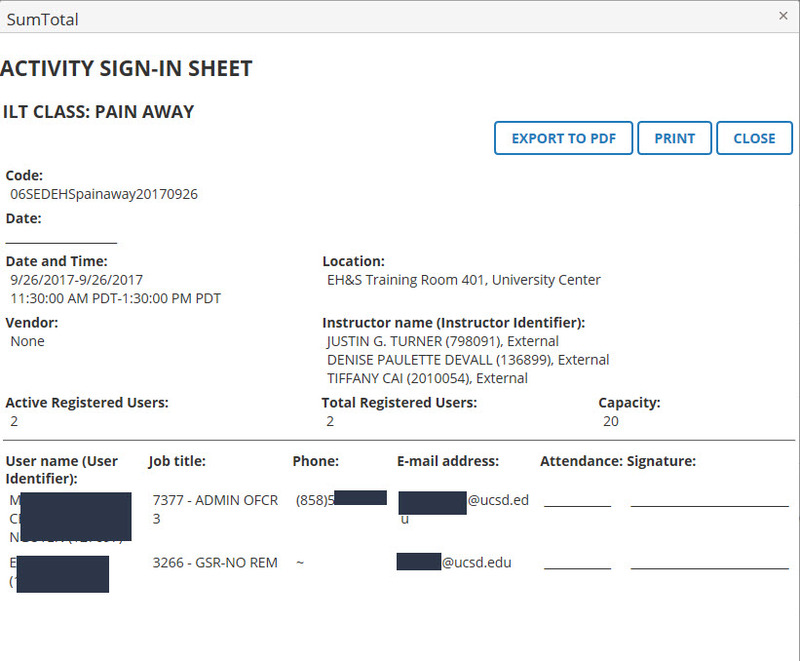 The UC Learning Center provides sign-in sheets that already have all the participants’ information, so all participants have to do is sign next to their information to indicate they attended the activity. 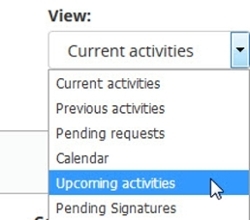 Locate the activity you wish view and click the Activity Roster Report Icon. You will be taken directly to the sign-in sheet for the activity, which will show only those currently registered to attend. You have the option to Export to PDF or Print the sign-in sheet directly. For best results, we recommend choosing the Export to PDF option. If you choose to Export to PDF another window will appear. You must click the File link to download the PDF. Click OK to close the window. The PDF will open in another tab or window depending on your browser settings. 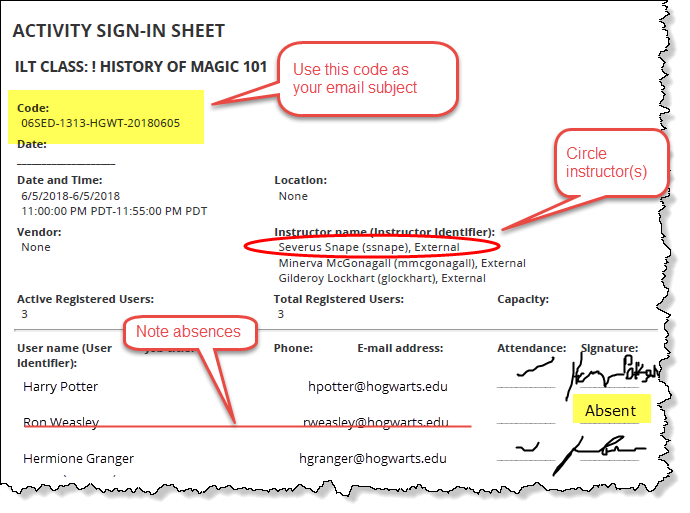 Note: If you are already on the roster page, you can view the sign-in sheet by clicking the Activity Sign-in Sheet on the left menu under Reports. Locate the activity you wish to view and click the Roster Icon. On the right hand side of the roster you will see an icon to print the entire roster and an icon to Export to Excel. When you click the Export to Excel icon another window will appear, giving you the option to limit the information you are pulling or change to a different format other than Excel. Click Next and another window will appear. You must click File to download the PDF, and then click OK to close the window. The PDF will open another tab or window depending on your browser settings. 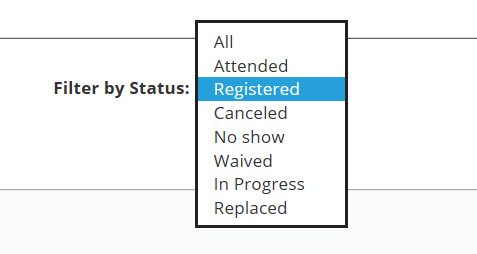 Note: If you only want those who are currently enrolled (versus those who canceled their registration) on an ILT class roster you can select the Registered option on the Filter by Status drop down menu. If you don’t select a filter everyone on the roster will be included in the export. Visit UC Learning Center: Activities to learn about activities offered through the UC Learning Center. After the class, scan or photograph your roster (please make sure it is legible! ), and e-mail it to staffeducation@ucsd.edu as an attached file (see sample e-mail below) - no hard copies please. If you are using the Staff Education and Development evaluation process, we will collect feedback using Qualtrics. Within two weeks after your class, you will receive an email with a link that will allow you to access a summary of the evaluations. We strongly encourage you to review the evaluation summary and make any changes that you feel will improve the effectiveness of the course.